Recently I had the opportunity to visit Hiroshima for the fourth time. It was at this same time that I made sure I took some time out to watch some baseball. Baseball in Japan is huge and I have talked about it extensively every time I have ever been to a game. Since it was my fourth time in Hiroshima, I had nothing special planned as I had seen all of the major sights in Hiroshima but I found out that the Hiroshima Carp would be playing, so I decided to take time to go to a game. I made a few mistakes when going to the game and I knew how to prevent it before the game but in general it wasn’t bad and I had a great time. For someone who isn’t that big into baseball, having the opportunity to see a game from a different perspective and going to different stadiums was a great opportunity for me. The Hiroshima Carp have been in the Nippon Professional Baseball league since 1950 and have enjoyed mixed success during their time in the league. They started out as perennial losers in the league but had a bright spell in the 70s and 80s where they were doing well. Unfortunately they fell back into the bottom of the league since the 90s and haven’t been doing so well until recently. 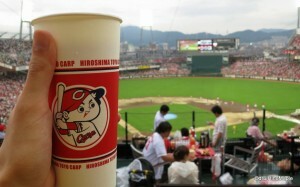 The Hiroshima Carp is a mishmash of various teams, ideals, and languages. The Carp team colours have been red since the 1970s and their logo was also changed at this time to reflect the Cincinnati Reds. Both teams have the same main colours and both have a “C” as their logo. Recently the Hiroshima Carp have been displaying “Carp” in English writing on their uniforms but they still proudly boast the white “C” on a red cap that is exactly the same as the Cincinnati Reds. 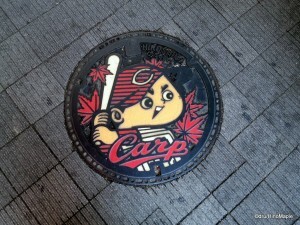 The Hiroshima Carp are loved in Hiroshima and the surrounding areas. Even though they had trouble in the recent past, there are still many loyal fans in Hiroshima but that doesn’t necessarily extend outside of Hiroshima. Of course the hometown boys will love the hometown team but that is always a given. Going to a Hiroshima Carp game is simple yet confusing. Finding the stadium is very easy as you just go out of Hiroshima Station, not the Shinkansen side, look for Carp Road, and walk that way. If you are going after 4pm, you can follow the crowds but in reality, you can just follow the Carp signs and the road to the stadium will be lined with stores selling food and beer. Once you do get to the stadium you have to decide which entrance to go to. There are two main entrances, the main gate and the other gate. The main gate is located close to home plate and allows easy access to get anywhere in the stadium. The stadium itself is very new, built in 2009, and has facilities that nearly match it. Most of the stadium has a lot of great amenities and wait to use the washroom was not that bad. The biggest problem I had was getting around. The stadium was stuffed into a small area but I feel they could have made it a bit bigger with more money invested into the stadium itself. The walkways for people to get around the stadium were too small for a double deck stadium. They have three concourses where you can walk but the upper concourses were just too small and useless as they often blocked sections off. 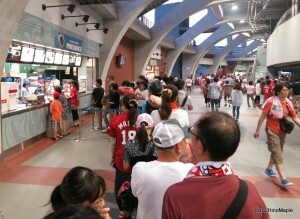 There were the typical drink, food, and beer vendors throughout the stadium. It was somewhat of a surprise for me to see udon and other soup and noodle based dishes at the game but that is very Japanese. I felt it strange to see something that I originally saw only on Mr. Baseball, but it does happen. I can’t remember seeing it at a Swallows home game though. The food was also poor as I waited in line to buy hot dogs and when I got there, they were sold out. The worst part about that was that it was a hot dog stand that I went to. They only sell hot dogs and they were completely sold out of hot dogs. Probably one of the worst things they could have done ever. They did have nice gelato at the stadium and I had never seen that in my entire life, except for someone who has box seats, but that is completely different. The game itself was also an interesting and unique event for me. 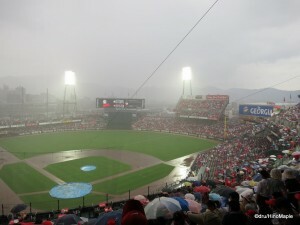 It was my first time to experience rain in a baseball game in Japan, let alone the world. The game was supposed to start at 6pm, but there was a somewhat long and heavy rain shower that caused the grounds crew to put tarps over the pitcher’s mound and home plate. Once the shower ended, the crew went to work drying the running lanes and pouring what looked like sawdust or kitty litter all over the dirt. I can only assume it was to help dry the running lanes and help prevent slippage in those areas. The game was delayed for an hour before the play finally got under way. The game started well with the Carp getting through the first inning rather quickly. They then proceeded to get a quick run in during the 2nd inning. Unfortunately the game was decided in the 3rd because Maeda, the pitcher for the Carp had a tough time getting the last out and gave up a homer to the Swallows which saw the inning end with the Carp down 3-1. It was near the end of this inning that I saw something I never thought I would ever witness in a Japanese baseball game. There was one big fan that got the crowd behind the pitcher. He alone with no help from his friends screamed at the top of his lungs the cheer for the pitcher Maeda. His screams along with clapping and looking at the crowd behind him got the entire stadium into doing the same. It was a great thing to see and of course I did join in. When the home team is having a bit of trouble and they need a little help to get back into the game, you do what you can to get them into the spirit. Jet Balloons Ready to GO!!! The game started to become pretty predictable after the 3rd inning with nothing noticeable happening for several innings. 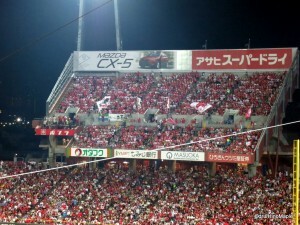 It wasn’t until the bottom of the 6th where the Carp batter, Soyogi, got a solo homerun to get the Carp to within one and the crowd was on their feet cheering the team. It was an eventful and exciting moment that had the entire stadium, save the Yakult Swallows cheering section, on their feet. I was starting to think that things were starting to change and the Carp could come back from behind when the heavens opened up just after the homerun and sent the entire stadium running. Everyone who wasn’t under the roof section started to open up umbrellas, put on ponchos, and eventually just run, well to be honest just walk orderly, for the concourses which were covered. I hung out there for about 10-15 minutes before the rains stopped and we all proceeded back into the stadium. It was a short shower so it was short work to clean up the field. Once the field was clean, the game restarted and the 6th inning came to an anti-climactic end. The bottom of the 6th saw the Yakult Swallows fans take out their small plastic umbrellas and start doing their little dance which I have seen several times. It was then time for the Carp to pitch and in the middle of the 7th, they did something that I hadn’t done in years. The first Hanshin Tigers game I went to had jet balloons. They are long balloons with a double bulb at the tip and a plastic insert at the bottom. You blow it up, don’t forget that you don’t tie it off, and sing the Carp song. Once the song has finished, you release your balloons and it makes a big hissing sound like a mini jet. I forgot how much fun it was and was excited to do it again. Ever since the swine flu outbreak a few years ago, most of the stadiums stopped that tradition and only a few places still do it, and only at home games. 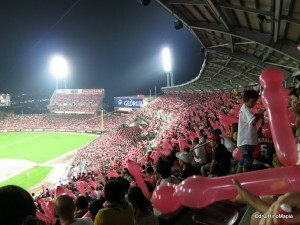 Someday when I visit Osaka or Kobe in the summer, I will go to a Hanshin Tigers game and I will set off the balloons for sure.The game itself was also an interesting and unique event for me. It was my first time to experience rain in a baseball game in Japan, let alone the world. The game was supposed to start at 6pm, but there was a somewhat long and heavy rain shower that caused the grounds crew to put tarps over the pitcher’s mound and home plate. Once the shower ended, the crew went to work drying the running lanes and pouring what looked like sawdust or kitty litter all over the dirt. I can only assume it was to help dry the running lanes and help prevent slippage in those areas. The game was delayed for an hour before the play finally got under way. The game started well with the Carp getting through the first inning rather quickly. They then proceeded to get a quick run in during the 2nd inning. Unfortunately the game was decided in the 3rd because Maeda, the pitcher for the Carp had a tough time getting the last out and gave up a homer to the Swallows which saw the inning end with the Carp down 3-1. It was near the end of this inning that I saw something I never thought I would ever witness in a Japanese baseball game. There was one big fan that got the crowd behind the pitcher. He alone with no help from his friends screamed at the top of his lungs the cheer for the pitcher Maeda. His screams along with clapping and looking at the crowd behind him got the entire stadium into doing the same. It was a great thing to see and of course I did join in. When the home team is having a bit of trouble and they need a little help to get back into the game, you do what you can to get them into the spirit. After the balloons, things were still mostly relaxed but the crowd was really into it again. It took a little while before their spirit was broken when the Swallows got another run in during the 8th inning. It seemed to be the end as the Carp brought in two pinch hitters in the last two innings and while one made it onto base, the other was knocked out. I still get surprised when I see a pinch hitter, especially when I see the stats. They usually have low hit percentages and they rarely get anything good. It can happen and I’m sure there is a reason but from my less experienced perspective, it makes no sense whatsoever. The game ended relatively quietly and everyone proceeded to go home. Like any other professional sport where you have tens of thousands of people in one place, it was slow going to get out but it was, as always, orderly. Since the Carp had lost, it was somewhat sombre but it could have also been the heat. 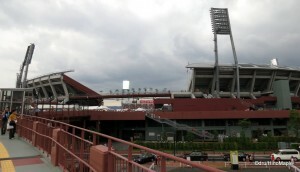 When going to watch baseball in Hiroshima, there are several things to know before going. During the holidays, make sure you get there very early to get good seats, or just to get seats. I spent about 30 minutes looking for seats as we had 4 people in our group. Arriving around 5:30 was too late and there were only single seats left. We did get lucky and found 2 seats together and then my friend ran into his student’s family who let us have two seats. That’s the good thing about being a teacher in Hiroshima. There aren’t too many of them so it is relatively easy to see your students everywhere and you can get some help when you do see them. The other thing is that you should check the weather. If there is a chance of rain, bring an umbrella, or better yet a poncho. From there don’t forget to bring a towel to make sure you have a way to dry the seats off after any rain. It is not advisable to buy tickets on the day of the game unless it is a weekday night and not during the holidays. Going during obon, in my case, meant that tickets were hard to get, if you could get any tickets. It was a full house and you could barely do anything. It was a lot of fun and I always recommend going to baseball games in Japan. You may not feel interested in baseball but the energy is second to none and it is a very Japanese thing to do. This entry was posted in Baseball and tagged balloon, baseball, Baseball in Japan, C, Carp, Cincinnati Reds, Hiroshima, Hiroshima Carp, Hiroshima Koi, hot dog, japan, Japanese Baseball, jet balloon, jet fusen, Koi, Maeda, Mazda, Mazda Stadium, Mazda ZOOM ZOOM Stadium, Mr. Baseball, Nippon League, obon, rain delay, Reds, Soyogi, Swallows, tokyo, Yakult, Yakult Swallows, ZOOM ZOOM by Dru. Bookmark the permalink. Baseball is a mystery to me. Cricket, yes. Baseball? Don’t have a clue. So I couldn’t follow most of this post, but I still enjoyed reading it. I grinned when you talked about kitty litter, I grimaced when I got to the sold-out hot dogs, and I was surprised when I read about the balloons-swine-flu connection. Cricket is a complete mystery to me. Hit the ball, run back and forth till you die? Not too sure. I’m also going from what I learned from the Cosby show. You should watch this. Typical American take on what Cricket is, and pretty funny. You’ve just given me one of the best laughs I’ve had this year! That video is GREAT! Earl Grey tea and cucumber sandwiches. Yum. Glad to give you a good laugh. I loved the Cosby show when I was young. One of the best shows in the world and showed that African Americans are just like any other person in America. Dru, have you taken part in Hanshin Tigers jet balloon attacks? I think Carp were the originals though but one game I saw at Koshien stadium with my two favourite teams (Tigers and Carp) had both sides with the jet balloon attacks abeit in different innings plus a victory balloon launch. So, three balloon attacks definitely sounds like a pain to clean up. I know Meiji Jingu Yakyujo doesn’t allow it but do you know if it’s only certain stadiums? or all stadiums? Jet balloon “attacks”? You mean the normal ones? I had jet balloons on Hiroshima last month. Also did it once at Jingu for the Tigers before swine flu stopped that. I think it is only stadiums that have a jet balloon culture allows it. Tokyo Dome doesn’t allow it.